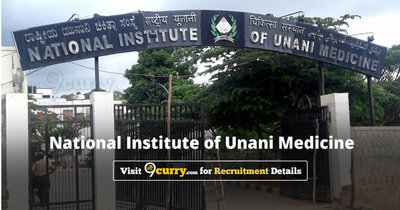 NIUM Recruitment 2019: National Institute of Unani Medicine / www.nium.in is conducting recruitment processes to fill 83 vacancies. As of now, there are two recruitment drives going on for 42 Professor, Reader & Other Posts and 41 Professor, Readers & Other Posts. NIUM Recruitment 2019 - Walk in for Lecturer Mahiyatual Amraz Post in NIUM, Bangalore on Contract Basis. Candidates are invited by National Institute of Unani Medicine to attend walk-in-interview to be held on 13 Feb 2019 10:30 AM for 1 vacancy. NIUM Recruitment 2019 - Walk in for Professor & Reader Posts in NIUM, Karnataka on Contract Basis. Candidates are invited by National Institute of Unani Medicine to attend walk-in-interview to be held on 29 Jan 2019 at 10:30 AM for 2 vacancies. NIUM Recruitment 2018 - Walk in for System Administrator, JE & LDC Posts in NIUM, Bangalore, Karnataka on Contract Basis. Candidates are invited by National Institute of Unani Medicine to attend walk-in-interview to be held on 20 Dec 2018 10:30 AM for 4 vacancies. NIUM Recruitment 2018 - Walk in for Gynecologist, Radiologist, Surgeon and Anesthetist Posts in NIUM, Bangalore, Karnataka on Contract Basis. Candidates are invited by National Institute of Unani Medicine to attend walk-in-interview to be held on 29 Nov 2018 10:30 AM for 4 vacancies. NIUM Recruitment 2018 - Walk in for Hindi Consultant Posts in NIUM, Bengaluru, Karnataka. Candidates are invited by National Institute of Unani Medicine to attend walk-in-interview to be held on 29 Nov 2018 10:00 AM for 2 vacancies. NIUM Recruitment 2018 - Walk in for Professor, Readers Posts in NIUM, Bangalore, Karnataka on Contract Basis. Candidates are invited by National Institute of Unani Medicine to attend walk-in-interview to be held on 30 Nov 2018 10:30 AM for 2 vacancies. NIUM Recruitment 2018 - Walk in for Hindi Consultant Post in NIUM, Karnataka on Direct Recruitment. Candidates are invited by National Institute of Unani Medicine to attend walk-in-interview to be held on 15 Nov 2018 at 10:00 AM for 1 vacancy. NIUM Recruitment 2018 - Walk in for Professor, Readers and Lecturers Posts in NIUM, Karnataka on Contract Basis. Candidates are invited by National Institute of Unani Medicine to attend walk-in-interview to be held on 25 Oct 2018 10:30 AM for 9 vacancies.